To many anglers, speeding between hot spots on the lake and filling the live-well is the epitome of fishing and a dream come true. However, for most, it is still just that: a dream. There are thousands of fishermen who, like myself, enjoy the sport from the confines of the shore and are able to pull in dozens of fish. Of course, angling from land presents a number of speed bumps, but with the right lures, technique and proper execution, anyone can pull in a lunker from that fallen tree ten yards out and turn even the most seasoned boat owner green with envy. Perhaps the biggest obstacle facing any shore fisherman is the high probability that any body of water they choose to fish will see high pressure from over-fishing. While many will interpret this as a problem, it is actually a challenge, the rewards of which can be surprising. There are two solutions to the hindrance that an over-fished body of water poses: get off the beaten path and/or make a short drive to find new locations, or find new ways to fish pressured locations. Often times, trekking through a patch of forest or meandering the fields and sparse trees of farmland can yield great results in the form of hidden rivers or untapped farm ponds rich with a variety of fish species. Discovering hidden ponds and lakes doesn't have to be as arduous as making your way through weeds and dense brush, of course. It can also be as easy as using an online map website, such as Google Maps, to view an overhead depiction of an area and simply exploring the map until you strike gold. More often than not, you'll be shocked to discover a small lake you never knew was hiding right around the corner. Now that you've found that perfect location, what do you do once you're there? The fishable water near the shores may be riddled with weeds and logs and there is a strong chance it will only be a few feet deep. These are not problems at all, but merely different situations that present varying opportunities to experiment with different lure types. The lures that have proven to be deadly when fished from shore include, but are not limited to, buzzbaits, spinnerbaits, soft plastic such as worms, lizards, small swimbaits, and tubes, and topwater frogs. Unless you're very lucky to find deep water, crankbaits that run deeper than a foot will most likely stay in the tackle box. Hitting a spot down shore from your location and retrieving the lure back towards you, parallel to the shoreline, is an ideal approach to fishing buzzbaits and spinnerbaits. By casting down the bank, you avoid scaring away any fish lurking just off shore. Of course, you can also cast directly out into the deeper water if the fish are situated that far out. If you're leery of throwing such large lures in small ponds, there are several companies that make smaller sizes of which, from experience, I can attest to the efficiency. Often times, bass in small ponds will position themselves near the shoreline and will even swim back and forth in search of prey. Take advantage of such predatory behavior and experiment with small buzz and spinnerbaits; trust me when I say that you'll be pleasantly surprised with the results. Another advantage to fishing from shore is the easy access to fallen trees and logs that every angler knows to be fish magnets. Whether they're using logs for shade during the summer, or taking advantage of the heat that stumps retain during the cooler months, fish will undoubtedly be found were there are submerged trees. I've found that soft plastics, such as small worms and lizards, Texas rigged, will be what you'll want to tie on in these situations. The weedless rig will allow you to toss it directly into a tangle of submerged branches or atop a log and slight twitches add a wiggling action that fish can't resist. Furthermore, being so close to the target will allow for a more accurate cast. If you're fishing from a dock and have a little deeper water to work with, then I would have to suggest trying out smaller (one and two-inch) soft plastic swimbaits. Northland Tackle makes such swimbaits in a variety of patterns, which you can buy individually, allowing you to build a small arsenal for your tackle box. I've had days when, out of everything in my tackle box, these small swimbaits were the only lures that produced fish. The swimbaits may not always land huge fish, but you'll be surprised at the amount of strikes a simple cast off the end of a dock and steady retrieve will produce. Tubes have also been a favorite of mine when presented with the opportunity to fish docks. If possible, try casting the tubes directly under the dock and retrieving it slowly back towards you, and even pause the retrieve every so often to twitch the tube in place and turn the followers into biters. One last lure that I always carry with me when fishing small lakes and ponds is a topwater frog. Nine times out of ten, such bodies of water will contain a fair amount of lily pads or thick grass mats that form a blanket on the surface. This is an optimal situation for the frog. Again, you might want to steer clear of using a larger size and instead opt for something smaller. Spro's Bronzeye Jr. frogs are perfect, as their small size appeals to a wider range of bass, but they still cast a mile. Start with these and work them very, very slowly across the pads, pausing to allow them to float when you reach an opening. For those of you who may want a little more involvement, I also carry a package of Strike King Rage Toads, as well as a package of Yum Money Toads. Rigged weedless with a wide gap hook (4/0 or 5/0 will work fine) and worked like a buzzbait, these beauties create a lot of noise and water displacement on the surface that provide topwater excitement in places where buzzbaits and poppers don't dare to tread. Experiment with different colors and patterns, but don't get overwhelmed by the choices at your local retailer. Start with the three basics: black, white, and chartreuse, then branch off to other variations. Furthermore, take advantage of the excellent vantage points and visibility that fishing from shore allows, compared to deeper water, and take the time to observe and learn how each lure works in the water. Watch how each one reacts to a twitch of the wrist or a sudden pause in the retrieve and remember that for when you get the chance to fish deeper water later on and can't see the lure as you reel it in. As I stated earlier, these lures aren't the only ones that will work when fishing from shore. However, they are, in my experience, staples that anyone confined to the bank should keep in their tackle box. 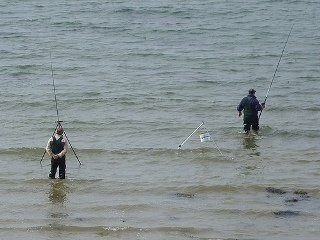 As someone who has spent the majority of his fishing life waving to boaters from shore, I can assure you that I have had many years to experiment, practice, and perfect the techniques and lures described here. If, like me, you find yourself without a boat, but still yearn to catch more than panfish on your day off, then try out what's worked for me over the years the next time you head to your local park. I promise you won't be disappointed. previous articleCould the Rutting Moon Stop You From Bagging That Big Buck?